When companies embark on construction projects of any size or scope, it's always a big undertaking. At Thomas-Grace, we're completely focused on making the process as efficient, smooth, cost-effective and streamlined as possible. That's how we've earned our roster of highly satisfied, repeat clients. Ultimately, selecting the right construction partner ensures a successful outcome. I started at an early age cleaning up residential job sites for my dad during the summer and weekends and learned the carpentry trade from him and other tradesmen in the Stillwater, Minnesota, area. I applied that knowledge to the commercial/retail industry in the early 90s as a lead carpenter traveling around the country installing store fixtures. A few years later I moved into the office as a project manager and eventually became Vice President of Operations. 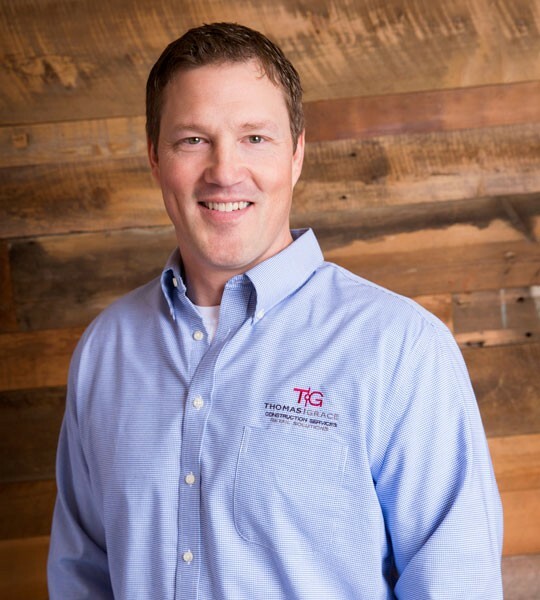 In 2002, I set out on my own to start a general contracting organization that would specialize in store fixture installation — and, more importantly, would focus on complete client satisfaction. Hearing how TGC is exceeding clients’ expectations. My goal is to hear that from every single company for whom we provide services. I love it when customers give me good feedback about their Thomas-Grace team, from field personnel to project management. Avid outdoorsman and hockey fan.